Wishing It Were August Again? Wednesday morning I’m looking forward to hearing from James Steward, the Gee-Whiz-How-Does-He-Do-It director of the Princeton University Art Museum. In his short tenure he has partnered with all kinds of organizations to bring new audiences to one of the best kept secrets on campus. He’s at the Princeton Chamber breakfast ($25 for members at the door). Thursday I’m going to learn how to wrestle with Google Plus, when NJ CAMA (stands for advertising and marketing etc.) hosts Lynette Young on the university campus. If you have added me to your Google Plus circle, I have not added you. I don’t embrace what I can’t understand. Friday it’s off to Rider University to see the opening concert of American Repertory Ballet and its gorgeous young dancers (it repeats Saturday). Also on Friday, Philadanco comes to TCNJ. And the next day, Saturday, September 21, dancers dance for world peace at the Princeton YWCA. What drives all this activity? Volunteers, of course. 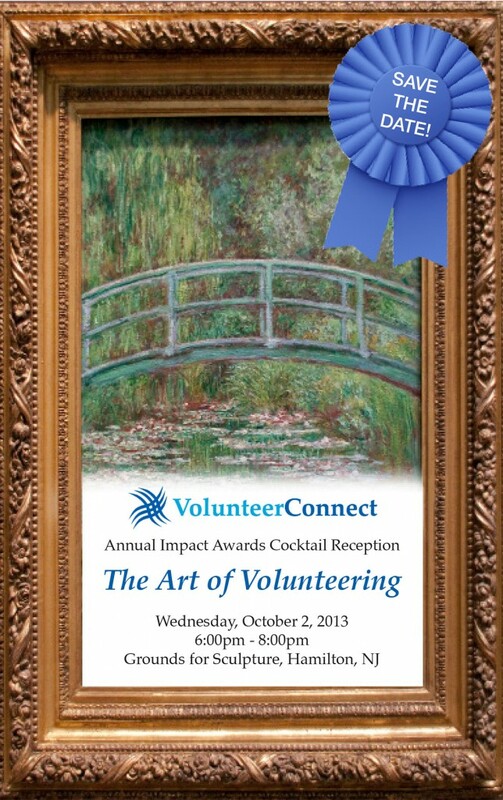 Volunteers in general, and some specifically, will be honored in a gala, staged by Volunteer Connect, on Wednesday, October 2, at Grounds for Sculpture, as you see at the top of the post. Volunteer Connect helps non-profits get skilled help, and helps professionals develop their skills. Somewhere in between I’m talking to Folks That Know about technical innovations in Mercer County. I’m writing a preview for the October 4 “Mercer Makes” seminar. That’s only three Fridays away — perhaps pencil it in. Septembers are always busy, but does this one seem more so?